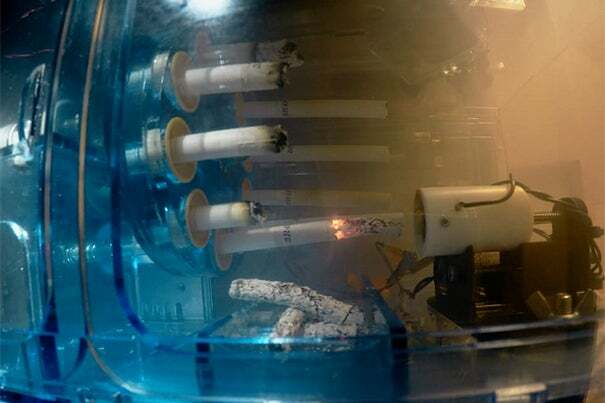 In a published study, the Wyss Institute describes an instrument they engineered that can “breathe” in and out, actively smoke regular and electronic cigarettes much like a human. Individual mouth pieces in a rotating unit of the smoking machine are fitted with standard cigarettes. While it is well known that cigarette smoking is a major cause of lung disease, and a key exacerbating factor for patients suffering from chronic obstructive pulmonary disease (COPD), it has not been possible to effectively model its deleterious effects on human lungs under normal breathing conditions. In an article in Cell Systems, a multidisciplinary team at the Wyss Institute for Biologically Inspired Engineering at Harvard University describes an instrument they engineered that can “breathe” in and out, actively smoke regular and electronic cigarettes much like a human, and deliver the smoke to microfluidic organs-on-chips lined by human lung small airway cells isolated from non-smokers or COPD patients. The integrated smoking system gives researchers a better understanding of smoke-related pathological changes in individual smokers, and could facilitate the discovery of more accurate biomarkers and new therapeutic targets. Progress in figuring out how exactly cigarette smoke worsens COPD, a so-far irreversible inflammatory disease of the small airways of the lung, has been glacial because researchers lack faithful models. Classical culture systems with human small airway cells are unable to reproduce the breathing motions of the lung and commonly used laboratory animals cannot reflect human smoking because they breathe through their noses, and their inflammatory responses differ from those in humans. In addition, human clinical studies have revealed great variability in the physiological and biochemical responses between patients, and they usually do not allow direct comparisons of smoke exposure versus no exposure in the same individual. The device leverages the Wyss Institute team’s previously developed human lung small airway-on-a-chip model for inflammatory disorders. “The device enables us for the first time to compare responses of human small airway tissues, from both normal individuals and COPD patients, before and after they are exposed to cigarette smoke delivered through physiological breathing outside the human body. 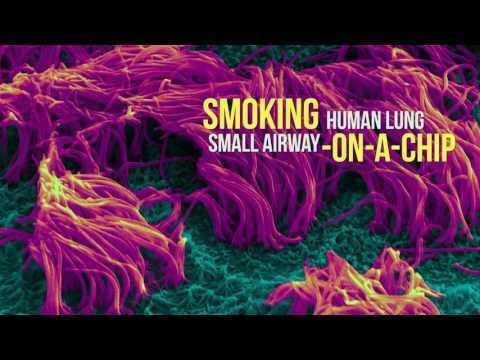 We can now begin to decipher which cell types, cellular functions, and genes contribute to smoke-induced injury in normal lung, as well as during COPD exacerbations in individual patients, and thereby, identify common as well as patient-specific disease factors,” said Wyss Director Donald Ingber, the Judah Folkman Professor of Vascular Biology at Harvard Medical School and Boston Children’s Hospital and professor of bioengineering at the Harvard John A. Paulson School of Engineering and Applied Sciences. “In order to translate observed breathing patterns and smoking behavior into biological effects, we combined the small airway-on-a-chip with a smoking machine that burns cigarettes and a microrespirator that inhales and exhales small volumes of cigarette smoke and fresh air in and out of the epithelium-lined channel in programmable intervals mimicking true smoking behavior,” said Richard Novak, a co-author of the study and a senior staff engineer at the Wyss Institute, who helped design the smoking instrument. The integrated smoking system recapitulates the complex oxidant-induced biological responses of normal lung cells to toxic molecules present in cigarette smoke as well as COPD-specific inflammatory responses. “We identified a COPD-specific signature by comparing gene expression changes in COPD-derived chips exposed or not exposed to smoke and subtracting the changes that we see in chips made from healthy lung chips. This type of analysis could lead to future biomarkers, drug targets, and possibly more personalized approaches to COPD in the future,” said first author Kambez H. Benam, a Wyss Institute technology development fellow. The team demonstrated that they can use this approach to investigate potential toxicity profiles of emerging tobacco-related products such as e-cigarettes. Benam was also able to analyze the behavior of mucus-transporting cilia protruding from the small airway cells into the smoke-exposed microfluidic channel in an automated high-throughput fashion working with Janna Nawroth, a past Wyss technology development fellow with co-author Kit Parker, a Wyss core faculty member and the Tarr Family Professor of Bioengineering and Applied Physics at the Harvard School of Engineering and Applied Sciences. “We found that cilia beating becomes more heterogeneous and reaches lower frequencies in chips exposed to whole cigarette smoke,” said Benam, who recently also received a Baxter Young Investigator award for his work at the Wyss Institute. The study was also authored by Mariko Hirano-Kobayashi, a past research fellow with Ingber at the Wyss Institute and Boston Children’s Hospital, Wyss research assistants Youngjae Choe and Thomas Ferrante, present and former Wyss senior staff scientists Rachelle Prantil-Braun and Anthony Bahinski, and James C. Weaver, a Wyss Institute research scientist. The project was funded by the Defense Advanced Research Project Agency and the Wyss Institute for Biologically Inspired Engineering at Harvard University. Scanning electron micrograph of a human T lymphocyte (also called a T cell) from the immune system of a healthy donor. Researchers have found that the molecular communication in healthy T cells is fundamentally different than that of overworked T cells, suggesting that a method of increasing their longevity could be discovered.